Shelby Fredericks fights against a defender. The junior attacker set a program record with 17 draw controls, but the Wildcats lost a thriller against Penn State. After a combined 61 shots, 16 free positions and 82 fouls, No. 16 Northwestern and No. 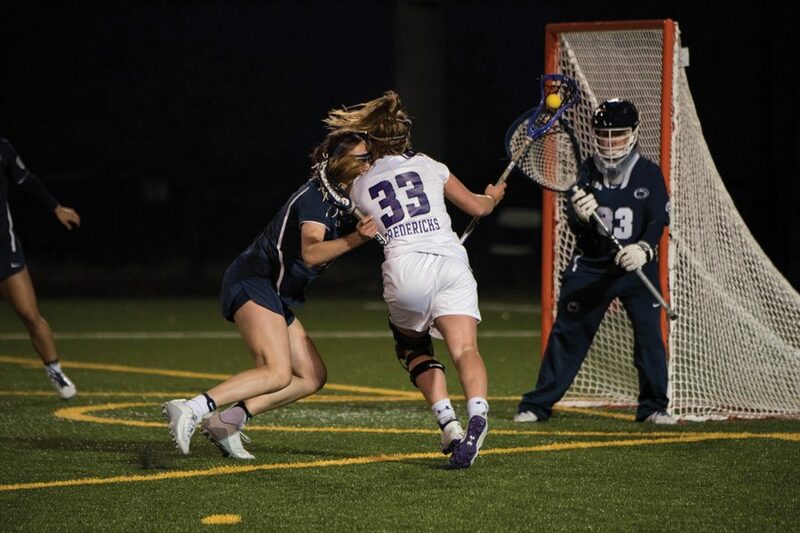 5 Penn State were separated by only three seconds and the netting of Nittany Lions goalie Cat Rainone on Thursday. Rainone’s back-to-back saves on shots by junior midfielder Sheila Nesselbush and sophomore attacker Liza Elder in the waning seconds sealed a 14-13 defeat for the Wildcats (7-7, 3-1 Big Ten) in a back-and-forth thriller at Martin Stadium. NU, as it often has this season, dominated the game early and looked well-positioned to secure a statement win when holding a 7-2 lead midway through the first half. But the Nittany Lions (14-1, 4-0) soon seized momentum, rallying back to tie the score 8-8 at halftime and then opening the second frame by posting four goals in 79 seconds. The hosts regained form and responded with four consecutive goals to tie the game at 12 apiece with 22 minutes to play. Two more goals by Penn State’s Katie O’Donnell — her fourth and fifth goals of the night — proved insurmountable, however, in spite of a top-shelf snipe by freshman midfielder Megan Kinna with 5:01 left that pulled NU within one. While running toward goal with 23 seconds left, sophomore defender Claire Quinn had a charge ruled against her that Amonte Hiller said was an unlucky break. Soon after, a takeaway led to Nesselbush getting an open look; she misfired and a last-ditch effort by Elder was snared by Rainone. Despite the loss, junior attacker Shelby Fredericks provided a bright spot in the circle, setting a program record with 17 draw controls. As a team, NU won 19 of the game’s 29 draws. Kinna, Elder and senior midfielder Catie Ingrilli each scored twice for the Cats. Senior attacker and overall leading scorer Christina Esposito, despite tallying two assists, was held to just one goal on a team-high seven shots — including several late opportunities that sailed wide. Last season, NU lost its regular-season meeting to the Nittany Lions before enacting revenge in the Big Ten Tournament semifinals. A potential rematch between the two teams looms next month, and Fredericks said Thursday’s physicality — which resulted in 46 fouls called on the Cats alone — could be merely a precursor of what’s to come.